This guide will show you how to add or delete a domain or a domain alias for your DV server within Plesk. For your domain to properly resolve to your DV, you will need to ensure that your domain is pointed to (mt) nameservers or you can point an A record to an IP address on your DV. If you are using Plesk as a reseller, make sure you create your subscription first so that you can add additional domains. Make sure you also add the domain in your AccountCenter. Please see this article for details. If you are in the Service Provider view (you have a left nav), complete the following. Next to the appropriate Domain Name, click Open in Control Panel. The Control Panel view opens. If you are in the Power User view, the Control Panel is open. On the Websites & Domains tab, click Add New Domain. Assign the new domain name. Select Website hosting, Forwarding, or No hosting. Complete the Hosting settings. Click OK. Your new domain is added. 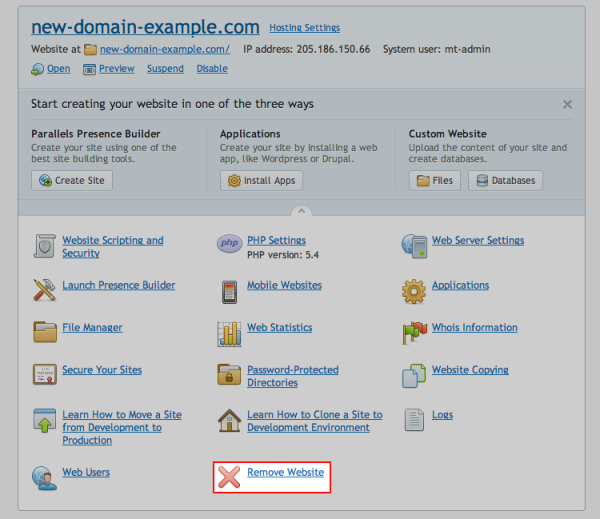 Expand the bottom arrow of the Domain you plan to delete. A domain alias will allow you to show the same website content for multiple domains. The alternate domains will remain in the URL (in the address bar of your browser). Aliases do not count against your Plesk domain total. On the Websites & Domains tab, click Add New Domain Alias. Add the new Domain Alias Name. Assign the (Primary) domain for this alias. 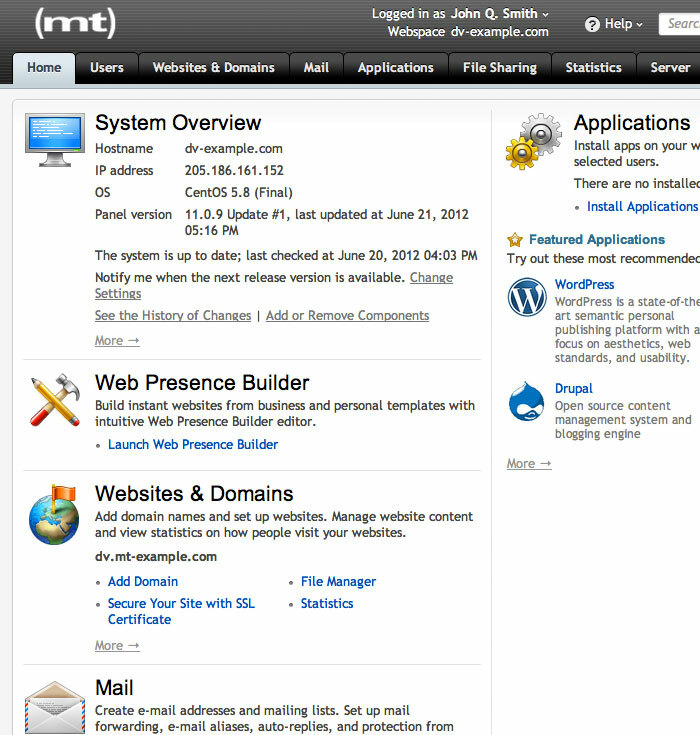 The new domain alias displays. Expand the section for the Domain Alias. Your domain alias is removed. This is the default admin panel for your DV. You can warp to this panel from your AccountCenter. 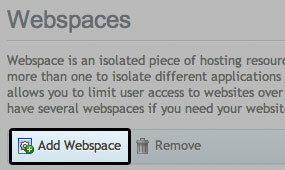 Follow these instructions if you want to add your domain to an existing webspace. 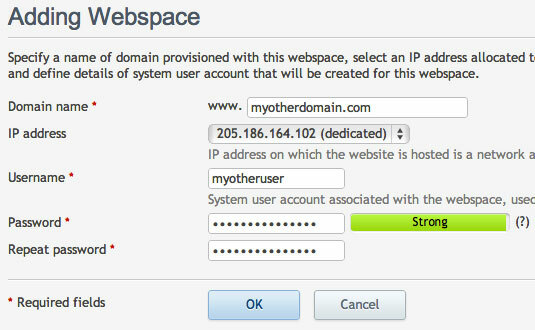 For example, mydomain.com and myotherdomain.com will be on the same webspace. Click the Websites & Domains tab. You should notice the default domain that you set up with your webspace here already. If you want to, you can click on it to change its settings. Complete the information for your domain then click OK. Enter your domain name, DNS settings, hosting type, and document root. Domain Name: This is the domain or subdomain you want to host. It should be something like my-other-domain.com. Do NOT use www in front of the domain. DNS Settings: Decide whether you want to use Plesk as your DNS nameserver or an outside nameserver. By default, the Plesk recommended option is Use our DNS settings. 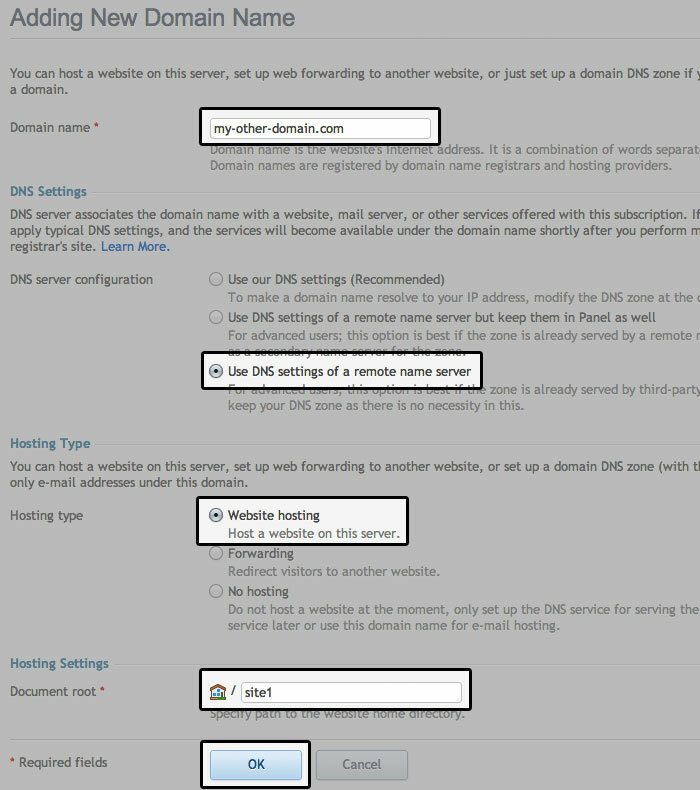 (mt) recommends selecting the last option Use DNS settings of a remote nameserver. 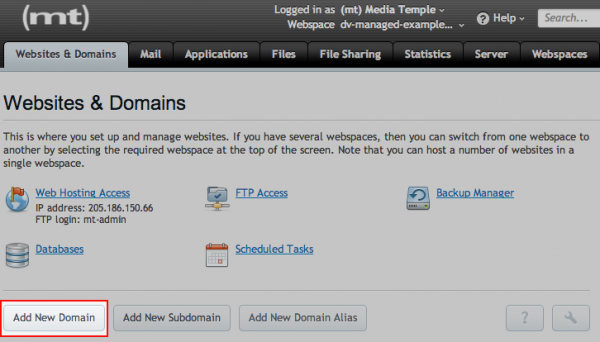 This will allow you to use (mt) Media Temple nameservers. Please see this article to make sure your domain is added to our nameservers in the AccountCenter. Hosting Type: Website hosting will allow you to upload content to the server here. Forwarding is for forwarding your domain to another website. No hosting allows you to set up an email-only domain. You will be returned to the main page. You should see a confirmation message at the top, and your new domain will be added to the list. Your domain has been added to the list. That's it! You can start uploading your website content. You might also want to check out the Resources list. Webspace is an isolated piece of hosting resources which will run your websites and mail. Every webspace is designated for multi-domain hosting, but you will need more than one to isolate different applications and limit user access. 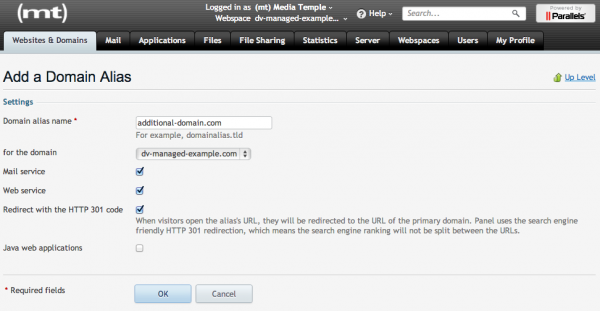 When you create a new webspace, the domain name you enter in step four is automatically added. You can verify this by clicking on the Websites & Domains tab after step five is completed. Enter the information for your domain. IP address: Select your IP address. Password: Please choose a strong password. Repeat Password: Please enter your password again. A domain alias will allow you to show the same website content for multiple domains. The alternate domains will remain in the URL (in the address bar of your browser). Aliases do not count against your Plesk domain total (100) allowed with the default license). If you want the URL to change to the target domain, you should use a 301 Redirect instead. If you want separate email addresses for the alias, you will have to add the domain normally in Plesk and choose Forwarding during the hosting configuration. Enter the domain alias name and click OK.
For more information on domain aliases, please see: Administrator's Guide, Parallels Plesk Panel 11.0: Adding Domain Aliases. You will need to enable this interface view. 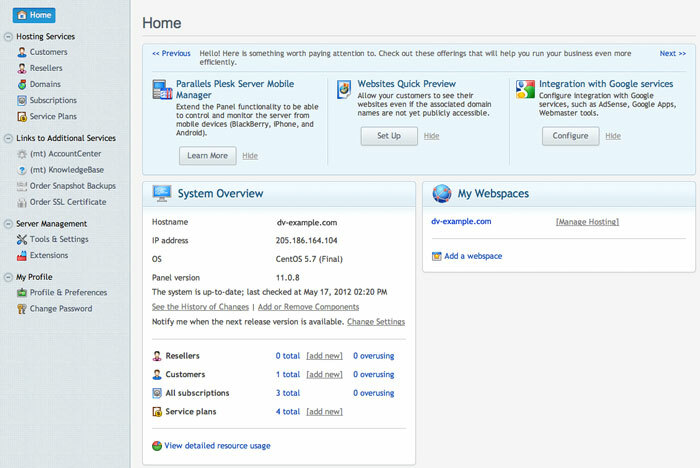 This interface is primarily used by resellers. For instructions, please see: How can I change my Plesk interface? We recommend that you add each domain as its own subscription. This method provides each domain its own Control Panel. Please keep in mind that each domain added in this manner will be a count towards your 100-domain license. Log into the Plesk Server Administration Panel. The Plesk Server Administration Panel. Complete your website and subscription information. Complete your domain name, username and password, and subscription details. Domain Name: Fill in your desired domain name. IP Address: Select the IP address for your subscription. Username: Create a username for this subscription. Password: Create a password for this user. Service Plan: Choose Default Domain, Unlimited, or None. These refer to resource allocation for your domains. Add-Ons: Choose the Web Presence Builder add-on if desired. This is a GUI for creating your website. Choose whether you want to want to customize the subscription parameters. If you selected the option to customize your subscription, you will now be brought to the Customizing Subscription screen. See this article for details. You will be returned to the main subscription page. Your new subscription is displayed. 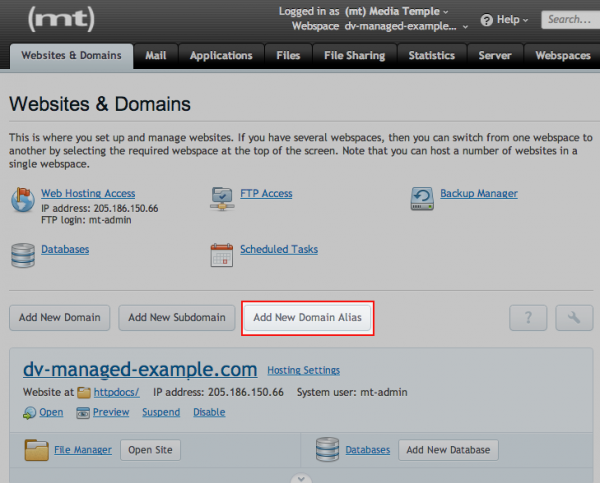 If you want to proceed with configuring your domains, click on Manage Hosting next to the appropriate subscription. 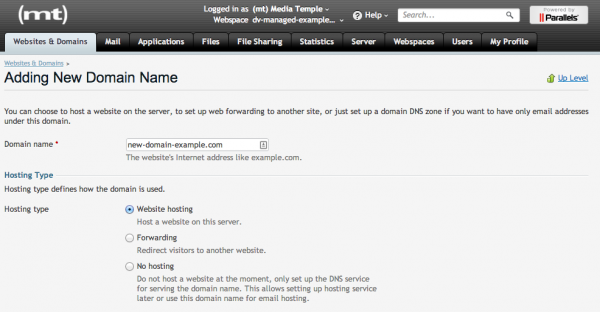 Click Manage Hosting to start configuring your domains. Follow these instructions if you want to add your domain to an existing subscription. For example, mydomain.com and myotherdomain.com will be on the same subscription. 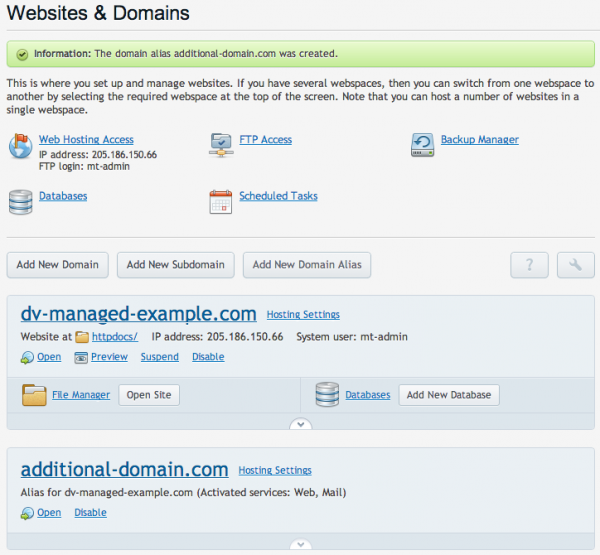 You will be able to access both domains from the same Control Panel. Please fill in the information for your domain, then click OK.
Domain Name: This is the domain or subdomain you want to host. It should be something like example.com. Do NOT use www in front of the domain. DNS Settings: Decide whether you want to use Plesk as your DNS nameserver, or an outside nameserver. Do not keep DNS zone on this server is the recommended option, which will allow you to use your (mt) Media Temple nameservers. Please see this article to make sure your domain is added to our nameservers in the AccountCenter. Document root folders are created in /var/www/vhosts/example.com/. The folder httpdocs is created by default. Additional domain folders are on the same level as the httpdocs folder, and belong to the same user (the domain user you created when you created your subscription). You now have the option to click on any of your domains and adjust their settings. You can change most of the original settings, and you also have access to several new settings as well. Feel free to enable or disable supported scripting languages. AWStats are enabled by default, so that you can see website statistics. Only check the box next to it if you want to password-protect the statistics. We also suggest that you check the box for Custom error documents, to make troubleshooting easier. If your domain will be using (mt) nameservers, you'll need to do add the domain in the AccountCenter. You manage the Zone File for your domain in the AccountCenter, not Plesk. For instructions, please see: How do I add a domain or subdomain to my server?